Also Available With PFA Insulated Cables (260ºC Maximum Temperature), Fiberglass Cables With SST Overbraid (-SB) or Fiberglass Cables With BX Amored Hose (-BX). Fiberglass Cables have 500ºC Maximum Temperature, See Individual Product Sheets. These thin film platinum RTD probes are similar to our PRTF-10 sensors except for the addition of a transition fitting and strain relief spring. Manufactured with 100 ohm, Class B DIN Platinum thin film RTD elements and fiberglass insulated and jacketed cables, these sensors provide a lower cost option to our "PR" line of RTD sensors and can be used in a wide variety of applications. The use of fiberglass insulated, fiberglass jacketed cables increases the maximum temperature rating of the sensor to 500C. .
For this product with a fiberglass insulated cable and square locked hose click this link. Standard: To order 2-wire sensors, change "-2" to "-1" in the model number and at the same price.To order 4-wire sensors, change "-2" to "-3" in the model number and add $5 to the price. 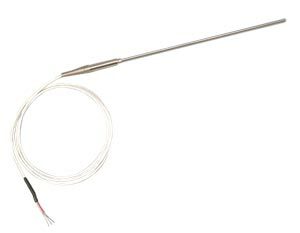 To order probes in intermediate lengths (2" minimum), change model number and use next longer probe price. For probe lengths over 24", change length in model number and add $1 per inch of probe length. For cables longer than 40", add cable length to end of the model number and add $1 per foot. Metric: To order probes in intermediate lengths (50 mm minimum), change length in model number and use next longer probe price. For probe lengths over 600 mm, change length in model number and add $1 per 25 mm of probe length. For cables longer than 1 m, add cable length to end of model number and add $3 per meter.